Gary Schwitzer is publisher of HealthNewsReview.org. He Tweets as @garyschwitzer, or using our project handle, @HealthNewsRevu. Mary Chris Jaklevic is a reviewer and blogger for HealthNewsReview.org. She tweets as @mcjaklevic. Combined, they have nearly 30 years of membership in the Association of Health Care Journalists, have recruited speakers for panels at AHCJ annual conferences, helped lead or speak on more than 15 panels, and served on the AHCJ Board of Directors for 8 years. 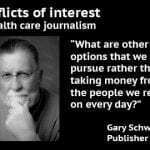 Perhaps few journalism organizations have tried harder to minimize conflicts of interest than the Association of Health Care Journalists (AHCJ), the leading professional organization for journalists who report on health care. The two of us know AHCJ well, having been members almost since its launch 20 years ago. We’ve both served on AHCJ’s board, attended most of its 18 annual conferences, and served on many panels as speakers or moderators over the years. Gary wrote the AHCJ’s Statement of Principles, which was adopted by the Board in 2004. 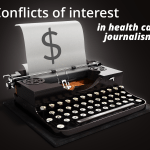 AHCJ states that its educational arm, the Center for Excellence in Health Care Journalism, won’t take money from pharmaceutical companies, device makers, insurers or even most advocacy groups such as the American Cancer Society. That strict standard distinguishes AHCJ from some other journalism training organizations, which have no qualms about accepting money from companies that journalists routinely report on. Red circle emphasis added. All sponsors’ logos rotated through this website spot. Yet we think AHCJ could do better. 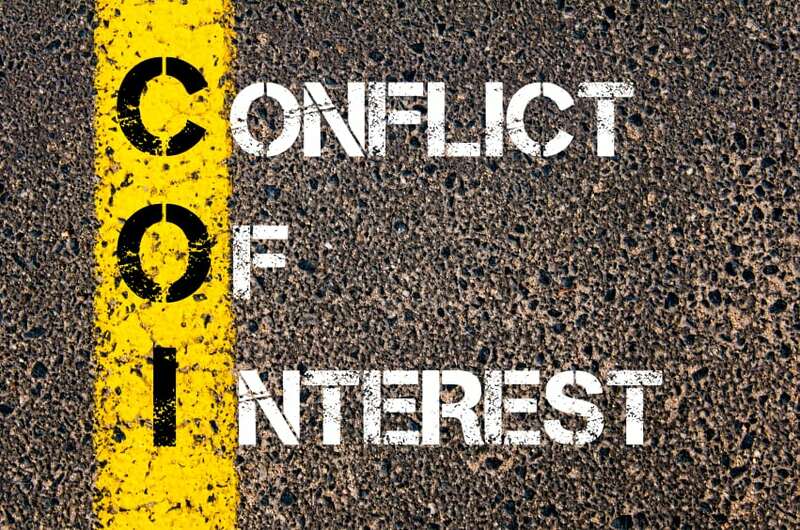 While most of its monetary support flows from philanthropic organizations, the association routinely solicits significant funds from academic medical centers in order to support its annual conferences, and that poses a conflict of interest. 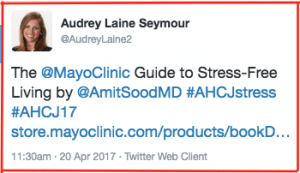 This conflict became strikingly apparent at AHCJ’s most recent annual conference in April in Orlando, where “host” sponsor Mayo Clinic was named as the sponsor of a “science basics” educational track, with sessions covering dementia, stress and vaccines. Mayo researchers were picked to speak at each session. The fact that the program listed these three sessions as being sponsored by the Mayo Clinic raised a few eyebrows, but in fact it’s routine for AHCJ to offer perks to academic medical centers that contribute money for its conferences; it’s just not always so obvious what those perks are. 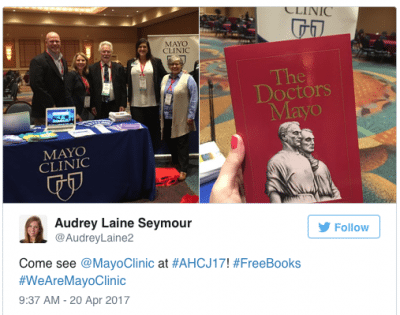 Several AHCJ members we talked to said they were troubled by what they perceived as the Mayo Clinic’s apparent influence over the educational content of the conference, but few were willing to let us use their names . Who says that the Mayo-recommended experts were the best available to provide journalists guidance? It seems clear that the three Mayo experts who spoke at the three Mayo-sponsored sessions were on that podium for one reason: because Mayo was the sponsor. 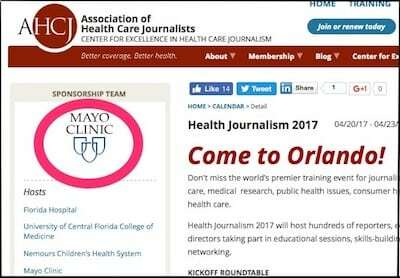 Even if AHCJ chose the topics, Mayo benefited from the exposure to journalists, as it would have if a field trip had been arranged. AHCJ could have been far more explicit with attendees about how and why Mayo experts took three of the five speaking slots at the three sessions. Because many conference attendees are young – and because many attend with support from AHCJ-sponsored fellowships – they may place AHCJ on an even higher pedestal than others do. But what does AHCJ, from that pedestal, convey to young journalists when it accepts a health care provider’s sponsorship – whether it be for field trips or sponsored sessions? Is this the message that journalists should take back home – that it’s OK to partner with or accept sponsorship deals with local provider organizations? Read some of Trudy Lieberman’s past articles on the pitfalls of this slippery slope. Also see sidebar with her quotes, lower on this page in the right hand margin. Bruzzese said moving the conference around the country creates”a chance to tap into local resources and local expertise that may not normally get tapped by regional or local reporters from another part of the country.” But with the conference in Orlando this year, local resources and local expertise weren’t employed when you consider that the lone speaker at the Mayo-sponsored stress session came not from Orlando or Jacksonville, but from 1,443 miles away, in Minnesota. More than 20 speakers at AHCJ’s 2017 conference were affiliated with host sponsors, as were most of the field trips. The field trips to sponsors’ campuses pose a conflict somewhat similar to sponsored sessions. The host sponsors suggest the topics for the field trips’ show-and-tell demonstrations and many of them are high-tech, gee-whiz showcases. Instead, AHCJ could use these excursions to promote topics prioritized in its own Statement of Principles, such as: the social determinants of health; the structural, institutional, political, financial and ethical issues in health, medicine and health care; health policy and public health issues. Of course, having done something questionable in the past doesn’t make it less questionable the next time around. In addition, it isn’t accurate to suggest that AHCJ has previously allowed an academic medical center sponsor to dominate an entire educational track with its speakers. Bruzzese and Stark pointed to the 2012 AHCJ conference in Atlanta, when AHCJ decided to assign the University of Georgia’s name as a sponsor of a track on the use of technology in journalism. But the university experts were not health care providers who could benefit from favorable coverage from health care journalists. Trudy Lieberman was AHCJ’s president when it first accepted sponsorship from academic medical centers more than 10 years ago. * Publisher note: As we write this, we learned of a fresh example of a health care reporter asking Mayo for help on a controversial story. But Mayo PR said no one was available to help. AHCJ could take steps to eliminate or minimize this inherent conflict. It could remove academic medical centers from the category of funders that are allowed to sponsor educational programming. It could decline funding from academic medical centers entirely. Or, it could allow academic medical centers to sponsor conferences but not individual educational tracks, while abandoning their exclusive invitation to pitch topics, speakers, and field trip proposals. AHCJ could enhance the local flavor of conferences by extending the same invitation to nominate session topics and field trip locations to non-sponsoring institutions in a conference city. Or it could decide to rely solely on local journalists and staff to come up with topics and speakers. This may not provide funders an overt marketing perk but it would bolster AHCJ’s reputation for integrity. The important thing is for AHCJ to separate fundraising from conference programming, similar to how news organizations separate advertising and editorial functions. If outside organizations work with AHCJ on programming, whether money changes hands or not, that should be disclosed as a collaboration. If it chooses to narrow the involvement of academic medical centers, AHCJ has other resources it could tap. It does a terrific job of soliciting foundation support and could work even harder to cover more of the conference costs (or improve its balance sheet) by soliciting just a bit more. Foundation sponsors for the Orlando conference this year included “endowing sponsors” Robert Wood Johnson Foundation and W.K. Kellogg Foundation, along with 13 other foundations listed on the conference website. As we write this, AHCJ has just received a new $1.3 million grant from the Helmsley Charitable Trust to, in part, support conferences/workshops. It could resolve right now to drop sponsored sessions and field trips in light of this generous philanthropic grant. In fact, AHCJ is doing very well financially and its membership has increased nine percent in the last five years according to data shared at the 2017 conference. So it’s a good time for AHCJ to re-examine its fundraising policy. Its “Category A” – from which it will accept “broad support” – includes “individual nonprofit academic medical centers.” But its “Category D” is explained in this way: “No funds or in-kind of support of any kind will be sought from funders in this category.” How does AHCJ define this category? “Private or public corporations or not-for-profit entities that sell products or services in the health care field. Examples include manufacturers of health care products, health care insurers, health plans, individual or corporate providers or medical practitioners, medical management organizations, private hospitals, marketing or public relations companies with an interest in healthcare, and any other entities with a commercial interest in the field, whether for-profit or not-for-profit.” Mayo Clinic fits in both categories. Who resolves these conflicts and how? 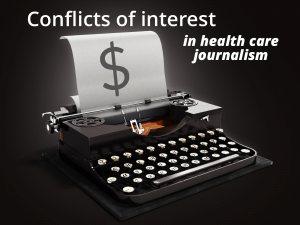 We suggest AHCJ shift its focus to raising more money from foundation sponsors, cultivating funds from universities and other organizations that train journalists, and leaning harder on news organizations to contribute more to the cost of the annual conferences. Weigh the potential conflict in accepting support from public, private, or foundation sources. We don’t think that AHCJ followed its own advice in this case. We appreciate the interest in maintaining AHCJ’s reputation as an organization of the highest integrity. We are proud of our membership, our training impact and the access we have advocated for and won on behalf of members. We are also proud of our policies regarding who can serve as a sponsor and with whom we will collaborate. Those guidelines are available for all to see at http://healthjournalism.org/center-fundraisingPolicy.php. 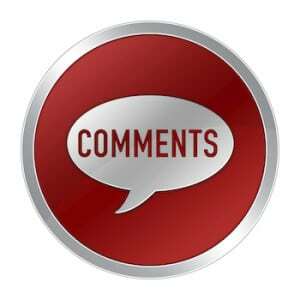 The authors of the commentary — Gary Schwitzer and Mary Chris Jaklevic as well as Trudy Lieberman, who offered an accompanying piece — all were AHCJ board members who voted to accept funding from universities and academic medical centers, or later endorsed the policy. Our position on funding was put in place in 2004 and has remained substantially the same for more than a decade. We routinely review our policies, especially when members have questions about them. To be clear, AHCJ doesn’t let funders dictate who will speak at our conferences and what the subjects will be. Every session is moderated by a journalist. The mini-track on science basics was our idea, not the Mayo Clinic’s. We chose the theme of the track and the individual sessions. We did ask Mayo for suggestions on panelists; in the end, three of the eight panelists in those sessions were from Mayo, and all were legitimately top experts in their field. As you note, 20 speakers from our four host institutions participated in the conference. But all told, we had more than 200 panelists. That means the overwhelming majority of our panelists were not connected with sponsors, which is typical given that we have encouraged session and speaker ideas from non-sponsors, members and moderators for years. Thanks for your note. We hope the AHCJ Board will consider our suggestions with an open mind for the improvement of health care journalism and for the open and transparent flow of health care news and information to the public. I was on the Board when AHCJ was in very serious financial trouble in 2004 when we met in Minneapolis. I recall that we had Kelly McBride from the Poynter Institute to guide us through some of the potential ethical dilemmas involved with any change in fundraising policy. I also recall at that meeting that the highly-respected journalist Ray Moynihan made an appeal to the Board not to loosen its fundraising policy. It was a tumultuous time. I am not embarrassed to admit that I don’t recall how I voted – nor what the final vote tally was. I do recall being very troubled with the dilemma the organization was in, and with the alternatives being considered. If you have the minutes to reflect the names of who voted, and how they voted, please post that information here. But as you point out, that was 13 years ago. You wrote, “We routinely review our policies, especially when members have questions about them.” Trudy, Mary Chris and I – and many other people we talked to in researching this series think it is time for this 13-year old policy to be reviewed now. That is the point of our series. AHCJ isn’t in the financial situation now that it was then. AHCJ has many other options available to it now. I knew Arterburn to be a leader in shared decision-making research and in trying to implement SDM into clinical care at Group Health. Merrikin, Arterburn, and Moulton (of Boston) worked to get the Washington state legislature to pass legislation to support SDM. They were logical choices, truly three of the best in the US on this topic. But AHCJ insisted that I add a fourth panelist, whom I did not know, whom I did not recruit, and whom I did not think fit on this panel. He was Benjamin S. Wilfond, M.D., director, Treuman Katz Center for Pediatric Bioethics, Seattle Children’s Hospital; professor and chief, Division of Bioethics, Department of Pediatrics University of Washington School of Medicine. When I asked AHCJ why I had to add him to the panel that I proposed and was to moderate, I was told that it was because he worked for conference host sponsors, UW and Seattle Children’s. That may only be a single anecdote, but that’s one thing about AHCJ conference involvement that I never forgot. So, Karl, in my experience, AHCJ either has let funders dictate who will speak at AHCJ conferences, or else AHCJ went out of its way to please a host sponsor whether the funder dictated or not. I’m not sure which would be worse. Please let us know how we can help when the Board reviews our suggestions at the next Board meeting. For what it’s worth, I’ve moderated several panels over the years. Occasionally AHCJ staff has sent me speaker suggestions from host sponsors. I never felt unduly pressured to put anyone on a panel and usually disregarded these suggestions unless I felt the person had something particularly valuable to contribute. That said, it seems the practice of taking speaker nominations from sponsors creates a vulnerability. Recruiting panelists can be hard. As much as we journalists like to think that potential speakers should feel privileged to talk to our influential group, not everyone can take significant time away from work, family and other obligations to present. Scheduled panelists often fall through. Sponsoring institutions can exploit such difficulties by providing an easy solution in the form of a ready-made speaker roster. That creates the appearance, if not the reality, of influence. Host sponsors were well represented among the medical experts who presented at this year’s conference. Two sessions — not including those explicitly sponsored by the Mayo Clinic — contained only speakers employed by host sponsors. The risk is that some of these presenters are picked because they are convenient, not because they are optimal. First off, AHCJ needs money to run the annual meetings. I get that. How they solicit and get it and its potential influence is the question. AHCJ does not hold its conferences where there are no big medical institutions (eg, Duluth, Boise, Hat Creek, California) and for good reason. We want to be near and see what institutions are doing. While it will not solve the problem, disclosure may help shine some light on it and “sanitize” it a bit. So I suggest a kick-off meeting at the beginning of the conferences at which the AHCJ leaders can acknowledge and thank the funders, including how much they have contributed, and which sessions their speakers will participate in. In addition, those speakers should be marked right at the session listing in the program as coming from a certain sponsoring institution. The amount of the contribution should also be listed at the front of the program — no amounts should be “proprietary.” As members of AHCJ, we should be able to see the amounts. Regardless of Len’s not wanting to state how much Mayo contributed, one of the Mayo public affairs people told me at lunch that they kicked in $30,000. Take that figure with some grains of salt in case it was an off-hand remark, but that’s what the guy said. As for AHCJ being in “serious financial trouble” in 2004 and thus voted to accept funding from universities and academic medical centers, it reminds me of the guy asking his date if she would go to bed with him for $1,000, which she said she would do. He asked if she would go to bed with him for $500, which she said she would do. When the offer got down to $50, she asked, “What do you think I am?” He replied, “We’ve established what you are. Now we’re just haggling over price.” I have no problem accepting the reality of the need for funding annual meetings as long as there are limits on who can contribute and there is transparency. But if one wants to be holier than Thou, then no outside funding should be allowed.